We just released a new version that adds better tracking for what listing sites have sent you inquiries and bookings, as well as the ability to easily see when you're dealing with a repeat guest. An important component of effectively managing your advertising is being able to see which sources drive the most inquiries, and from those inquiries which convert most into bookings. We've added a new Listing Site Conversion report which you can see under the Reports section. 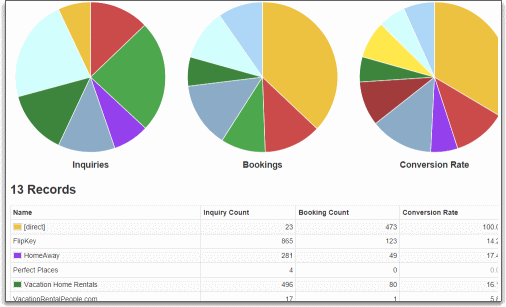 This allows you to analyze the data in your OwnerRez account and easily see where your inquiries and bookings come from. Its good be able to know if your guests have stayed with you multiple times, so you can give them extra care or target them specifically in a remarketing effort. We now detect repeat guests by email address in inquiry, quote, and booking overview pages and display a badge that allows you to click and see their previous bookings. You can also go to the Repeat Guest report in the Reports section to get a list of all repeat guests in your OwnerRez account with their stay dates and number of times they have stayed. This is outstanding! I just looked at the repeat guest report and have a couple of potential improvements. --Would it be possible to separate the repeat guests from the guests that do multiple bookings by evaluating if they had stays in different time frames? --If the total $$value of these customers was displayed it would allow us to offer them perks, etc. --Finally, having a pure repeat booking rate is really the single best indicator of the overall experience of our guests. If you could display this... Awesome. Thanks again, this is great! Those are some great ideas! I'll look into adding them in our next release. One question: what exactly do you mean by "pure repeat booking rate"? Is that something you would see next to each guest in the repeat booking report? Or are you looking for a percentage that is total number of repeat bookings vs. total number of bookings overall? Like, "out of your 5324 bookings, 759 were repeat bookings, giving a 14% repeat booking rate"? I think an overall repeat % like you mention above. By pure repeat I'm computing not based on single stay multiple units booked but rather multiple stays.